Nitrocellulose is a highly inflammable compound produced by nitrating cellulose by exposure to nitric acid or other powerful nitrating agent. Nitrocellulose when utilized as a low-order explosive or propellant it is known as guncotton. 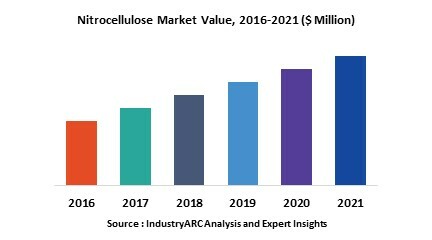 Globally, Technological Advancement, Rising Technology and manufacturing process cleaner are the prime growth drivers of Nitrocellulose market. In addition, emerging economies such as China, India and others, will create new opportunities for global nitrocellulose market. However, higher cost of the research and development, and Due to changing consumer preference for cheaper leather alternatives are the key restraints for global nitrocellulose market. Asia Pacific dominated the global nitrocellulose market. Demand from emerging economies such as China and India is the primary attributing factor for this scenario. Asia Pacific region is expected to witness maximum growth during the forecast period. The larger scope of expansion in end-use industries such as leather tanneries in Vietnam and automotive industry in Taiwan, South Korea, and India is expected to benefit the market demand in the region. Europe accounted for a significant share of the overall market. However, the region is predicted to lose market share owing to growing demand in Latin American and Asia Pacific. This report identifies global nitrocellulose market size in for the year 2016-2021, and forecast of the same for year 2021. It also highlights the potential growth opportunities in the coming years, while also reviewing the market drivers, restraints, growth indicators, challenges, market dynamics, competitive landscape, and other key aspects with respect to Nitrocellulose market. This report on global Nitrocellulose is segmented on the basis of Nitrocellulose application, end-use industries using nitrocellulose for wide range of end-use applications and market size in various geographical regions. This is report has been further segmented into major regions, which includes detailed analysis of each region such as North America, Europe, Asia-Pacific (APAC) and Rest of the World (RoW) covering all the major country level markets for Nitrocellulose in each of the region.